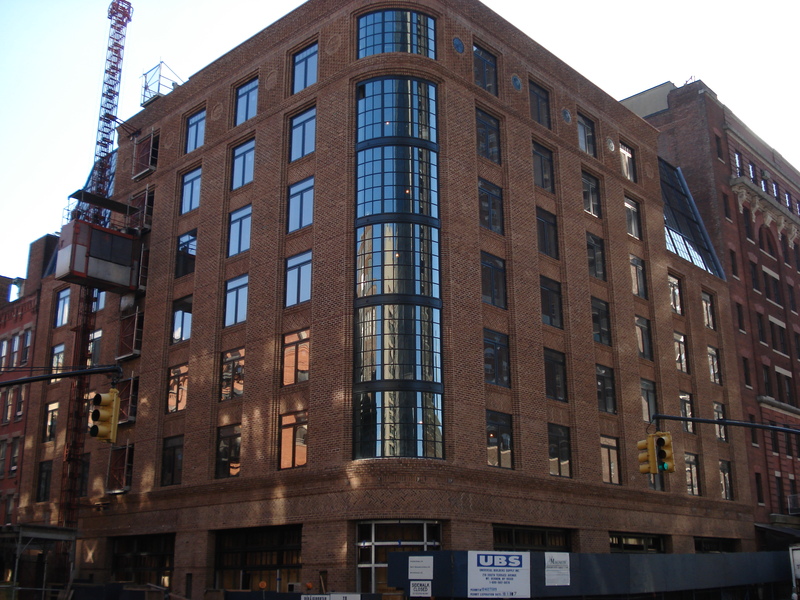 Construction of DeNiro’s luxury hotel at 377 Greenwich Street nears completion. Photo:Morgan Kunz. Developers sought brownfield credits, but had excavated and remediated site before DEC denied claim. 377 Greenwich LLC, developers of a seven-story luxury hotel and restaurant at Greenwich and North Moore Streets, conducted soil tests on the site and discovered two 550-gallon unregistered underground storage tanks. The developers applied in 2004 to the state Department of Environmental Conservation to have the site recognized as a brownfield under a newly enacted brownfield law that offered substantial tax credits. At the time of its application, the developers, with principals Robert DeNiro, Ira Druckier and Richard Born, held an approved remediation plan from DEC that addressed findings from the tests. Under the brownfield law, if DEC determines that the site is a brownfield, it prepares a remediation plan with community comment. With DEC’s investigation pending, the developers at 377 Greenwich excavated and remediated the site. The developers then submitted new soil tests showing that the contamination covered 50 percent of the site and cost $1 million to remediate. In 2005, DEC denied the developers’ application, finding that the low levels of contamination did not complicate development of the site. The developers filed an article 78 petition, but Justice Judith J. Gische upheld DEC’s determination. The court noted that the legislature rejected a draft that would have allowed all contaminated sites to be recognized as brownfields and instead chose to limit the law to those sites where the contamination complicated development. Since the developers had already received financing for the luxury hotel’s construction, the court found it rational for DEC to conclude that the hotel would have been constructed regardless of the contamination and the developer did not need tax credits as an incentive to remediate the site. Justice Gische agreed with DEC that the developers eliminated the reason for the analysis under the brownfield law by remediating the site. The court noted that tax credits could only be obtained by completing all the steps required by the law, including a remediation plan with community involvement, and could not be applied retroactively. 377 Greenwich LLC v. State DEC, 2006 NY Slip Op. 26453, Nov. 15, 2006 (N.Y.Cty.Sup.Ct.) (Gische, J.). CITYLAND Comment: While the brownfield application was pending, the developers received Landmarks approval of the project design, 1 CityLand 46 (Dec. 2004), and a variance approval from BSA permitting the development to exceed floor area, wall height and setback restrictions. 2 CityLand 120 (Sept. 15, 2005). Construction of the hotel is nearly complete.